Sonos Trueplay: What is it? How can you use it? | What Hi-Fi? Sonos' audio calibration technology aims to tune your Sonos system to your room to deliver the best possible sound. Here's what you need to know. A large chunk of Sonos’ charm has always been its ability to improve its speakers at the drop of a firmware update. We’ve seen it with sound improvements pumped to the Playbar and Play:1 after launch, and now with Trueplay, Sonos aims to make sure your system is calibrated to your listening environment. Announced alongside the new Play:5 speaker and now available via the Sonos app across the Sonos range, it aims to help you get the most from your Sonos speaker, no matter where you place it. Read on for everything you need to know. Sonos Trueplay will automatically calibrate your speaker and optimise it for its surroundings. Sonos says that too often it has found consumers with their speaker placed in less-than-ideal settings – tucked in a corner, placed on the floor or just put in a room that’s not great acoustically. These are all scenarios that Sonos wants to help to improve with its Trueplay technology. Sonos says users shouldn’t have to have any knowledge of good speaker placement in order to get the most of their Sonos product – they should be able to put it wherever is convenient and still get great sound. And this applies to individual Sonos speakers and Sonos home theatre setups, all of which can benefit from Trueplay tuning. Trueplay will work with all of Sonos’ all-in-one speakers, so the Play:1, Play:3 and both generations of Play:5, as well as the Playbar and the new Playbase. Alongside your Sonos speaker(s), you’ll need an iOS device to do the measuring, like an iPhone, iPod Touch or iPad running iOS7 and above. There’s good reason for the Apple exclusivity. In order for Trueplay to work reliably, it’s important that the microphone in the measuring device is consistent, otherwise it could result in tuning discrepancies that Sonos can’t risk. It needs to be able to ensure an accurate result at all times. Sonos tested Apple devices and found their mics to be very consistent from device to device, but found significant differences between the microphones on Android devices, even between the same phone on different networks. It’s working on a solution – Sonos built two microphones (currently switched off and users will be informed before they're turned on) into the new Play:5 to help futureproof it for future iterations of Trueplay. It's not sure how just yet, but said that one potential use is them being used as a reference point to help calibrate an Android microphone, though it'll continue to research other solutions too. Until then though, you only need an iOS device to perform the Trueplay tuning process. After that you can listen to a Trueplay-optimised speaker using your Android controller as usual, should you prefer. Sonos says each speaker that is shipped is expertly tuned to deliver music as close as possible to how the artist intended. 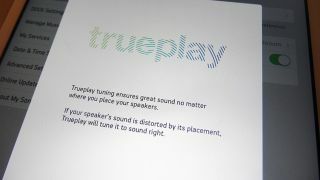 Trueplay is listening for any alterations to the sound, so it can correct it. It does this by having your speaker emit a series of tones and sweeps across the frequency range, with the microphone on your iDevice recording the results. It isn’t mapping your room like calibrating an AV receiver might do, but instead listening to soundwaves and the way they behave and bounce around a room. It listens to lots of cross sections across the frequency range, taking an accurate map of the frequency shifts in the room and making any necessary changes in what Sonos says is a very precise way. For example, if your speaker is in a room with a lot of glass, high frequencies won’t die away as quickly, while a speaker tucked in a corner might find its lower frequencies are amplified. Trueplay’s job is to balance this out. How do you set up Trueplay? Trueplay is found in the Room Settings of the Sonos app, and any speaker that is yet to have been through the Trueplay process will be marked with a red dot (if it’s in a stereo pair, they will be tested as one). In all, it takes about three minutes the first time, due in part to the fact you have to watch the demo video in full, and then around a minute or so for each additional speaker. Firstly, your environment will be tested to make sure it is quiet enough, and once you’ve got the all clear, the test tones will sound. During this time you’ll need to walk around your room, slowly moving your iOS device up and down through the air. You might look a bit daft, but it’s important to keep moving, with a slight concentration on any specific listening areas you might have in the room. The app does a good job of prompting you if you’re doing things wrong though, and will tell you if you need to move around more, or move the device faster or slower. As long as your environment manages to stay reasonably quiet during the 45-second process, Trueplay should be successful, though there has been some clever tech built into it to take account for normal household noises. For example, there’s an algorithm designed to specifically cancel out dog barking. Clever stuff. You'll only have to perform the Trueplay procedure once per speaker, but if you reposition your speaker into a horizontal or vertical position, or move it to a different room, you should of course retune it for its new situation. If your speaker is in a good place, you might not hear any changes in sound whatsoever. During the beta process, Sonos said around 50% of speakers saw a change. Either way, after completion Trueplay will let you know whether it’s made any tweaks or not, also letting you know whether they were big or minimal. If you don’t like the changes, you have the option to switch off Trueplay (which also doubles as an easy way to do a quick A/B listen), with EQ settings still available after the process has finished should you wish to make further changes yourself. What's the future for Trueplay? Sonos is calling Trueplay more of a strategy than a feature, with its launch in 2015 billed as the first phase in a timeline it sees stretching 10 or 15 years. Since launch support for the Playbar soundbar has been added, alongside the ability to fine-tune multi-speaker Sonos home cinema setups. This year saw the launch of the Playbase, which also supports Trueplay calibration. With a voice-controlled Sonos speaker said to be on the way, expect Trueplay to appear as standard on that, too. Trueplay is now part of the Sonos Controller app on iOS. Make sure you have the latest version of the Sonos app before you calibrate your speakers.